Russian and Chinese experts agree on the limited appeal and erroneous nature of a political rapprochement between the two countries with the sole purpose of challenging the US. In fact, there are far greater strategic objectives Russia and China should be pursuing. Political relations between Russia and China were never as good as they are today. They are now almost free of any suspicion, and older-younger brother complexes in relations have been relegated to the past. There is no objective reason for either of the two countries to compete against the other. In fact, their economic and security interests are complimentary. The prerequisites for a conflict between them only exist in the imagination of US political pundits. This is especially true for Central Asia, which neighbors both Russia and China, and from where the potential terrorist threats emanate. That said, the relations between Russia and China are not without challenges and issues that they should address together. Could the cooperation between the two super powers grow into a military and political alliance? How can the economic dimension of their relations be strengthened? What sectors of the economy are better equipped for enhancing industrial cooperation? What could be the practical elements of a strategy to link China’s Silk Road Economic Belt initiative and Eurasian integration? Did Russia succeed in its “pivot to the East” policy and what is its status now? 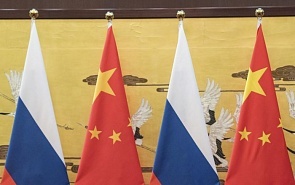 These were the issues on the agenda of a Russian-Chinese conference held by the Valdai Club in Shanghai, China, on March 25−26. The participants discussed these issues in a spirit of openness and trust, enabling them to identify a number of issues that have yet to be resolved and even outline specific ways to improve political and economic cooperation. The biggest challenge for Russian-Chinese relations is the fact that they still haven’t been able to come to a shared vision of the strategic objectives in terms of their relations and the situation in the world in general. Western countries, i.e. the US and its allies, have a clear understanding of what they want in their relations with Russia and China. They want to crush the former and contain in all possible ways the latter. For Russia and China, understanding how they will coordinate their actions to oppose the intentions of the West is a matter of strategic importance. But before Russia and China get there, they need to come up with a vision of the long-term relations between them. In Russia, the old-time pro-Western lobby opposes any attempt to develop relations with China and a pivot to the East in general. Meanwhile, two schools of thought have been opposing each other in China in a standoff between supporters of Deng Xiaoping’s line calling for “remaining in the shadow and saving strength,” and those backing a more proactive great-power foreign policy. The latter view presumes the strengthening of China-Russia military and political cooperation as the main prerequisite for China’s global success. If, at the end of the day, China opts for conducting its foreign policy as a great power, this would exacerbate its rivalry with the US, since its foreign policy would be aimed at countering efforts by the United States to restrain China, as well as building alternative global governance institutions. Russian and Chinese experts agree on the limited appeal and erroneous nature of a political rapprochement between the two countries with the sole purpose of challenging the US. In fact, there are far greater strategic objectives Russia and China should be pursuing. First and foremost, they should strive to reform the global governance framework and make it more equitable. Another important objective would be to exclude any possibility for any one country to have the right to play judge in global affairs and juggle with the world and security in other regions at its will. The Russian and Chinese experts were in full agreement on this point. The opinion that Russia and China could opt for creating a full-fledged military and political alliance is gaining momentum. So far it is clear that they are not ready for this yet. Russia remains somewhat restrained when it comes to entering into formal and binding alliances, while China highly values its sovereignty and flexibility in all matters of international politics and is not willing to give up this advantage despite the increasingly chaotic nature of international relations and outside pressure. Nevertheless discussions on scenarios that could make this alliance a necessity are picking up steam. By cleverly blending into the existing international framework dominated by the US and its allies, China has been able to successfully develop its economy over the past decades. For this reason, many Chinese colleagues strongly believe that as China increases its economic clout the issue of whether its interests should be taken into account would go away. This perspective emerged at a time when the country was going through a period of rapid extensive growth and is now supported by Chinese old-school experts. This growth was underpinned by such processes as urbanization, booming investment in infrastructure and the drive to become an export-driven economy. This growth also went hand in hand with capital accumulation, the synergy of business and bureaucracy and large-scale capital outflow with a view of legalizing and reinvesting it. However, this model has started to break down in recent years. The focus on exports has been viewed as a dead end since the 2008−2009 downturn, and the objective to shift to a domestic consumption model, as part of the “Asia for Asia” trend, has already become an official priority. Economic growth is decelerating and is no longer strong enough for people to shut their eyes on recurrent problems such as income inequality and corruption. Ordinary Chinese people are increasingly irritated by the discrepancy between the country’s global role and its weight and possibilities. Nationalist aspirations are gradually winning over China’s political landscape along with the strengthening of left-leaning ideologies. Old-school politicians are now on the defensive and losing ground, with some of them even losing their jobs. However, China has been slow to achieve a new consensus on its foreign policy. Russia and China therefore should devise strategies for dealing with new projects related to global economic governance. For China, the biggest challenge in terms of its interests is the Trans-Pacific Partnership (TPP). Even though TPP has not affected Russia in any meaningful way, it still needs to respond to the changes in the global regulatory environment. There were Russian experts who pointed out during the discussion that the role of official institutions could decline in the future, replaced by interstate agreements. TPP has become the first treaty of this kind. Russia and China must quickly understand what their approach will be to this new framework and how they will then work with it. Both Russian and Chinese experts acknowledged that trade and economic relations between the two countries are still lagging behind political relations, which have reached historic heights. Bilateral trade is not the only case in point. China’s share in Russia’s foreign trade is constantly growing. It has tripled since late 1990s, accelerating against a backdrop of Russia’s economic woes and deteriorating relations with the West, increasing from 11.3 percent to 12.1 percent in 2015. Although bilateral trade declined by USD 20bn, in relative terms trade with China has been expanding, while trade with EU shrank from 48.1 percent to 44.8 percent. China is now Russia’s biggest trade partner, whereas in 1999 it trailed not just Germany, but also Ukraine, the US, Belarus and Italy. Even during the crisis of 2015, monthly trade volumes between the two countries were on par with annual trade in 1999. The overall structure of trade and economic cooperation is in need of improvement. Experts have highlighted an important issue in this respect: Russian and Chinese businesses still lack information about doing business in each other’s countries. As long as energy remains at the center of these relations it is unlikely to serve as a solid foundation for political rapprochement. Falling oil prices along with China gradually losing its function as the world’s assembly line, make this model inefficient and unpromising. In the long-run, Russia and China could see their economic relations decline, and this could lead to some undesirable political consequences. For this reason, conference participants stressed the need to develop industrial cooperation as an important and promising area of cooperation. Experts said that in this respect, creating a new body for coordinating Russian-Chinese efforts should be a priority since it could help systemize information about conducting joint industrial projects, in the defense sector in particular. Strengthening economic ties with China is an important element of Russia’s pivot to the East. The leading experts note that far from losing momentum this process has been gaining traction in recent years. Conference participants in Shanghai also discussed further efforts to link Eurasian integration with the Silk Road Economic Belt project. Cooperation in this area is based on the Joint Declaration signed by the presidents of the two countries on May 8, 2015. Most Chinese experts agreed that this was one of the most important bilateral documents since the signing of the 2001 Sino-Russian Treaty of Friendship, and that the future of the bilateral relations should be to a large extent related to implementing this declaration. Russian experts shared their perspectives on the implementation of the project to link Eurasian integration with the Silk Road Economic Belt project. They answered specific questions on what institutions and organizations would be involved in this process, what areas of the economy and regulatory framework will be touched upon, and what efforts should be undertaken in this respect. At the same time, Chinese experts have every reason to ask for specific details on the project in order to link the two integration initiatives on the state level, saying that they expect the Eurasian Economic Union to come up with a clear action plan that China could relate to. Conference participants also identified a number of issues that have yet to be addressed. The foremost priority in this respect is to strengthen the institutions behind the project to link Eurasian integration with the Silk Road Economic Belt project. Chinese experts proposed putting high-rank officials from both countries in charge, arguing that working on the level of deputy ministers would not suffice. Another issue identified during the conference is that China so far has been lacking a comprehensive approach to the Silk Road Economic Belt project. Unlike Eurasian integration that already operates based on a number of framework agreements, the Silk Road Economic Belt project still remains a promise to a large extent. Russian experts pointed out that even the latest decisions by the Chinese parliament did little to clarify how this initiative will be implemented.